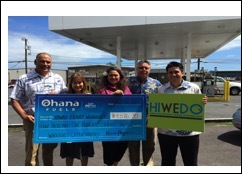 In photo from left to right: front: HFN Commercial Marketing Representative Joy Madriaga, presents check from “Fuel Up. Do Good”. Community Grant. HIWEDO Staff: Christopher Parayno & Carol Matayoshi Back: Hawaii Petroleum Inc. President Kimo Haynes, HFN General Manager Lloyd Leong, Hawaii Petroleum Inc.
“The mission of our Giving Program is to help meet the needs of the communities we serve by supporting non-profit organizations that improve overall quality of life. 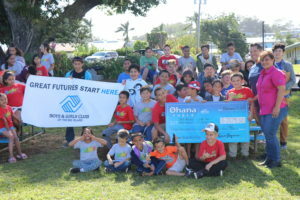 Ohana Fuels proudly sponsors programs that enhance the vitality of our neighborhoods, celebrate our community’s success, and support local charities”, said Kimo Haynes, President of Hawaii Petroleum Inc.
We greatly appreciate the generosity of Ohana Fuels along with parent company Hawaii Petroleum for their contributions and support. 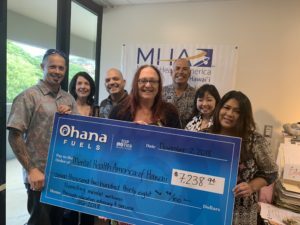 In a testament of corporate and non-profit sectors partnering together, Ohana Fuels is able to help the most vulnerable individuals and families in our community. HIWEDO is a private non-profit agency established in 2005; the agency broadly supports workforce and economic development initiatives. HIWEDO’s programs are designed for access to all, however, its focus is on at-risk youth, unemployed and underemployed individuals, the underserved population, and small businesses. This contribution will directly support HIWEDO’s Huiana Student Internship Program. 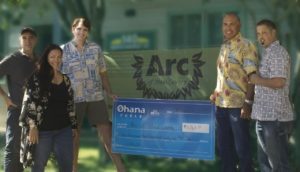 This program focuses on Hawaii Island youth as the labor force of the future with the strategy of developing the workplace skills of our high school students. Huiana connects school-based learning with work-based learning by placing students in 60-hour internships that are tied to their career pathway interests. This helps students to hone in on career interests, teaches job readiness and workplace excellence skills, and enables students to reflect on and develop their work ethic, thereby, fostering relevance in education. Huiana is open to all students but is designed to assist at-risk students. The program serves approximately 90 students a year. Ohana Fuels has four locations on Hawaii Island and eight on Maui. Ohana Fuels gasoline has been certified as TOP TIER™ to meet the premier standard of gasoline for optimum performance and fuel efficiency recognized by six of the world’s top automakers, BMW, General Motors, Honda, Toyota, Volkswagen and Audi. TOP TIER™ additives help clean your engine; optimize fuel economy; eliminate hesitation, stalling, and rough idling; restore optimum performance; and reduce emissions.